In terms of area, Nauru is one of the smallest states in the South Pacific and the third smallest by area in the world- it's had a strange existence, from a political point of view- it became a League of Nations mandate jointly administered by the UK, Australia and New Zealand with a brief period of occupation by the Japanese in World War II. Afterward, the mandate fell to the United Nations, again, keep the three government structure, though I guess that was more of a formality than anything else and in practice, Australia ran the place. But the flag! The flag was adopted on January 31st, 1968 for National and Civil usage. The blue in the flag represents the island's blue skies and the Pacific Ocean. The star has twelve points and each point represents one of the twelve original tribes of Nauru and the gold line is symbolic of the equator. 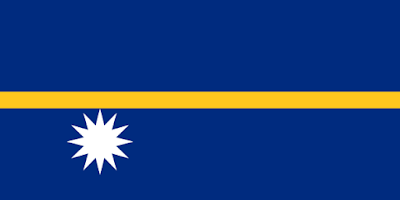 The placement of the star is representative of Nauru's location just south of the equator and it's color- white- represents the phosphate which was one of the island's chief exports. The division of the flag into two equal parts recalls the saga in which the first inhabitants were brought to earth from two boulders. So, there you have it- the flag of Nauru! Remember, until next time, keep your flags flying- FREAK or otherwise!